Long and slim leg for a better resistance against shocks. 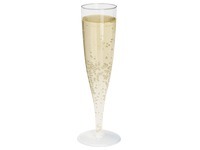 Moulded champagne glass. In a pack of 12. Content 16,5 cl. Dimensions: H 19,3 cm, diameter 5,55 cm. Champaign flutes as clear as glass.